Qatar must make "additional progress" on improving conditions for the army of nearly two million migrant workers helping the Gulf state prepare for the 2022 World Cup, FIFA has said. The candid admission from world football's governing body comes after two recent reports into the slow pace of change in the oil-and-gas-rich country by Amnesty International and Human Rights Watch. 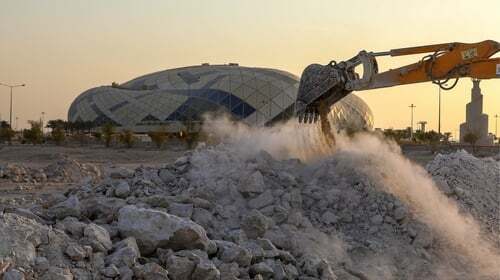 Qatar's labour laws, particularly the 'kafala' sponsorship system for migrant workers, have been under increased international scrutiny ever since the country was controversially chosen to host football's biggest tournament in December 2010. But despite repeated promises to scrap the most restrictive elements of kafala, give workers greater legal protection, improve safety and increase pay, progress has been patchy. In a statement released, a FIFA spokesman said it "welcomes the important steps taken in recent months" by Qatar but "we share the view of Amnesty International that additional progress is needed for the full implementation of the commitments for comprehensive labour reform". The spokesman added that the Qataris are "working intensely" with the International Labour Organisation and others to improve matters and said FIFA "continues to engage" with the local organising committee to "ensure respect for the rights of workers who are involved in World Cup-related activities". But with Qatar now two-thirds of the way along its journey from winning the bid to hosting the tournament, Middle East labour law expert Nicholas McGeehan believes FIFA has failed to use its leverage to demand quicker and more meaningful changes. "Qatar has promised the earth but the reality is that despite all the noise about their reform process, they have yet to deliver on key reforms that will effectively protect workers," McGeehan said. "FIFA and other influential actors should be clear about what they expect Qatar to do, and should be demanding a timetable for serious reform of the kafala system, which is as entrenched as it has ever been and remains the central pillar of an extremely abusive labour system." This view tallies with Amnesty International's latest report, which is titled 'Reality Check: The state of migrant workers' rights with less than four years to go until the Qatar 2022 World Cup'. In a statement, the organisation's deputy director of global issues Stephen Cockburn said: "Time is running out if the Qatari authorities want to deliver a legacy we can all cheer - a labour system that ends the abuse and misery inflicted upon so many migrant workers every day. This followed a similar assessment from Human Rights Watch in its 'World Report 2019'. Its deputy Middle East director Lama Fakih said: "While Qatar has taken some important steps to protect human rights, there is still a long way to go before migrant workers are protected from abuse and exploitation." The Qatari government has finally responded to the Amnesty International report, welcoming its "continued interest and scrutiny of labour systems in Qatar and the wider region". In a statement published on its communications office's website on Wednesday, the government said: "From the outset, we have said that we understood labour reform would be a journey and not an end in itself. "We have publicly stated, and restate here, our commitment to labour reform so that Qatar would have a suitable labour system that is fair to employers and employees alike. "Far from seeing time as running out, the Government of the State of Qatar understands further change is needed and we remain committed to developing these changes as quickly as possible, while ensuring they are effective and appropriate for our labour market conditions.